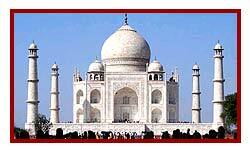 Splendid Rajasthan Holidays - Exotique expedtions provide online bookings to rajasthan holidays along with guide bookings at each attractions of tour. Arrive Delhi by international flight. Meeting and assistance on arrival and transfer to hotel. Rest of the day at leisure. Overnight at hotel. Breakfast at hotel. Morning city sightseeing tour of Old and New Delhi, visiting Qutab Minar, India Gate (War Memorial), Humayun�s Tomb, drive past President's House, Parliament House, and Secretariat Buildings. Also, visit Raj Ghat - the cremation site of Mahatma Gandhi, Jama Masjid and drive past Red Fort and Chandni Chowk, shopping centre of Old Delhi. Rest of the day free for independent activities. Overnight at hotel. Breakfast at hotel. Morning drive to Mandawa (250 km / approx 5 hrs drive). Upon arrival at Mandawa, check-in at hotel. Afternoon tour of the town and its painted Havelis. Mandawa, a small town has many Havelies and temples. The terrace of the rugged Fort provides a panoramic view of the town. See the extraordinary frescoes on the walls of the houses. Overnight at hotel. Breakfast at hotel. Morning drive to Jaipur (170 km / approx 4 hrs drive). Upon arrival Jaipur, check in at the hotel. Evening visit local bazaars and rickshaw ride. Overnight at hotel. Breakfast at hotel. Morning excursion to Amber Fort including elephant ride. Amber Fort, the ancient capital of the State until 1728. Visit the Jag Mandir or the Hall of victory glittering with mirrors, Jai Mahal, and Temple of Kali. Ascend on Elephant back, the hill, on which the fort is situated. Afternoon city tour of Jaipur visiting Maharaja's City Palace, the Hawa Mahal (Palace of Winds), the Royal Observatory and Albert Hall. Later drive through this Pink City's business and residential areas. Overnight at hotel. Breakfast at hotel. Morning drive to Khimsar en route visiting Nagaur Fort (280 km / approx 5 hrs drive). Nagaur Fort is a prime tourist attraction located in the Nagaur city. It is a beautiful sandy fortress built in the 2nd century. 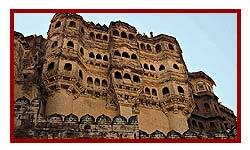 This is the best flat land fort of Rajasthan and is famous for its high walls and huge campus. The Nagavansh is constructed this fort and later, it was renovated by Mohammed Bahlim. The fort has three main entrances; the first entrance was made of iron and wood spikes to guard against elephant charges and enemy attacks. The second entrance is �Beech Ka Pol� and the last entrance is �Kacheri Pol�. Tourists can see many palaces, fountains, temples, and beautiful gardens inside the fort. Upon arrival at Khimsar, check-in at hotel. Overnight at hotel. Breakfast at hotel. Morning drive to Dechu (130 km / approx 2 hrs drive). Upon arrival at Dechu, check-in at resort. Afternoon jeep safari on the dunes. Overnight at the resort. Breakfast at hotel. Morning drive to Luni en route visiting Jodhpur (128 km / approx 3 hrs drive). Upon arrival at Jodhpur visit the Meherangarh Fort, situated on a low sandstone Hill, including Moti Mahal and Phool Mahal. Also visit Jaswant Thada, an imposing Marble Memoriam built in 1899. Later continue drive to Luni (38 km / approx 45 min drive). Upon arrival at Lunch, check-in at hotel. Rest of the day at leisure. Overnight at hotel. Breakfast at hotel. Morning drive to Udaipur En route visiting Ranakpur temples (280 km / approx 6 hrs drive). Ranakpur built in the 15th century is situated in the lovely valley of the Aravalli. Its surrounding is quiet and picturesque. Ranakpur has grand structures and beautiful sculpture. There are 1444 pillars in the temple and none of them are similar. The magic of light and shade is really awe inspiring. Surya Temple and other Jain Temples are side attractions. Upon arrival at Udaipur, check-in at hotel. Rest of the day free for independent activities. Overnight at hotel. Breakfast at hotel. Morning city sightseeing tour of Udaipur, visiting the City Palace, Jagdish Temple and Sahelion-Ki-Bari (Queen's resort for her friends). Afternoon boat cruise on lake Pichola, 4 km long and 3 km broad, surrounded by splendid hills, palaces, temples, bathing Ghats, and embankments. Visit the island palace Jag Niwas which is beautifully set in the Lake. Evening visit Bagore ki Haveli for local dance and music. Overnight at hotel. Breakfast at hotel. Morning drive to Bhainsrorgarh en route visiting Chittorgarh and Menal (270 km/ approx. 5 hrs drive). Visit the celebrated Fort of Chittor, said to be originally built by Mighty Bhim, one of the Pandava heroes of the Mahabharata legend. Also visit the Vijay Stambh with nine storeys and 37 mts high built by Maha rana Kumbha to commemorate his victory over muslim rulers of Malwa and Gujrat in 1440. Kirti Stambh, the Tower of fame 22 meters high is covered with figures from Jain Pantheon. En route visit to ancient Menal Temple and its complex, which was built in 6th century. Upon arrival, check in at the hotel. Rest of the day free for independent activities. Overnight at hotel. Breakfast at hotel. Morning visit Bhainsrorgarh, situated within a sprawling fort and poised over a fantastic cliff over the Chambal River. Later drive to Bundi (98 km / approx 3 hrs drive). Enroute visit Kota. Upon arrival check in at the hotel. Rest of the day at leisure. Overnight at hotel. Breakfast at hotel. Morning visit Bundi, is a district located in the Hadoti region of Rajasthan at a distance of 36 km from Kota. Ornate forts, splendid palaces and Rajput architecture, beautifully carved in brackets and pillars, make it a beautiful place to visit. Later drive to Talabgaon (195 km / approx. 3 hrs drive). Upon arrive check in at hotel. Rest of the day free for independent activities. Overnight at hotel. Breakfast at hotel. Morning village walk. Later camel cart ride or Camel ride through the village for 45 minutes. Later drive to Agra (240 km / approx. 5 hrs drive). En-route visiting Fatehpur Sikri and Abhaneri. Abhaneri (90 km from Talabgaon) was originally named Abha Nagri, which means "city of brightness," but due to mispronunciation, the name was changed. The city is now in ruins, but it attracts tourists from across the globe. It is located opposite Harshat Mata Temple and was constructed in AD 800. Chand Baori consists of 3,500 narrow steps over 13 stories. It extends approximately 30 m (100 ft) into the ground making it one of the deepest and largest stepwells in India. Fatehpur Sikri 38 km before Agra, the `Deserted City' built by the Mughal Emperor - Akbar the Great in 1569 and later abandoned due to political reasons and scarcity of water. See the halls of Public and Private Audience, the royal apartments, and the Panch Mahal. In the religious section see the Jumma Masjid and the exquisite tomb of Salim Chisti. Continue your drive to Agra. Upon arrival, check-in at hotel. Overnight at hotel. Early morning (at sunrise) visit world famous Taj Mahal built by the Mughal Emperor Shah Jehan in 1630 for his queen Mumtaz Mahal to enshrine her mortal remains. (closed on Fridays). Return to hotel for breakfast. 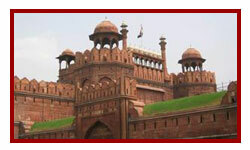 Later visit the Agra Fort near the gardens of the Taj Mahal stands the important 16th-century Mughal monument known as the Red Fort of Agra. This powerful fortress of red sandstone encompasses, within its 2.5-km-long enclosure walls, the imperial city of the Mughal rulers. It comprises many fairy-tale palaces, such as the Jahangir Palace and the Khas Mahal, built by Shah Jahan; audience halls, such as the Diwan-i-Khas; and two very beautiful mosques. Later drive to Delhi (204 km / approx. 4 hrs drive). Upon arrival at Delhi, transfer to international airport to connect flight for onward destination. 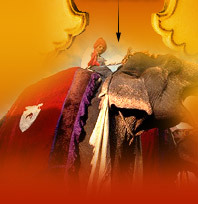 Simply fill the form to get tailor made and customized tour request and price quotations from Exotique Expeditions Pvt. Ltd.